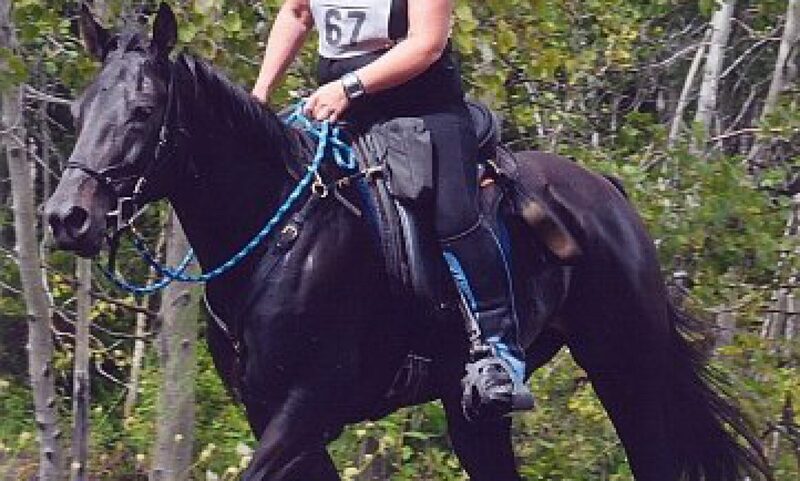 Last year I placed a Standardbred filly in a riding home. Her name is Spanish Lady. She came back to me this fall, through no fault of her own. She’s been renamed Ella, and has had some trail miles and walk-trot lessons with kids put on her in the meantime. She’s quite pretty, and sound. She never raced. Her ground manners are a bit lacking though. She is so friendly that she’s pushy and prone to move into your space (even onto your foot if you’re not careful!). She is not the least bit sensitive, and it sometimes requires a considerable increase in volume to make her see whatever point you are trying to make. The flip side of that is that she seems to have no spook whatsoever in her soul. Flapping tarps, logs, jump standards, tires… nothing fazes her. She’s placid about trailer loading. Puts up with first aid treatment of cuts. Stands for bandaging or clipping, etc. So she’s quite a nice sort of horse, but still unlikely to find a home before the Spring. Which was a bit of a problem, given that I don’t have enough hay, we are in the midst of a hay shortage (it’s available, but very pricey! ), and I can’t work until January. Especially since I also had Diego come back to me unexpectedly shortly before Ella. Veronica and Ella… working on turns. I am listed on the OCTRA website as a mentor, so I sometimes get beginners to the sport contacting me. Veronica is one of those. She is really enthusiastic, and has volunteered at a couple of competitions already. She doesn’t have a horse of her own though. So I offered to lease Ella to her (just out of the goodness of my heart… well, that and enlightened self-interest LOL!!). Veronica is interested primarily in Competitive Trail. Since heart rates are a major part of the scoring, it’s important that horses, particularly the non-Arabians, have good resting heart rates. Some horses have resting heart rates that are so high that even at rest they would incur penalties (anything above 44bpm). Arabs recover faster than other breeds, so if you can start with a low pulse you probably have a better chance of competing against them. I pulled out my stethoscope. There was Ella on the cross-ties, pawing quite rudely, demanding treats. I rather expected something around the 44 mark. Ares runs around 40-44. King is usually about 36-38. Dressy has been as low as 28, but she skips beats, so it depends on when you start your count. I put the stethoscope on Ella, and listened for a moment. Well damn. Strong, slow, and steady as a metronome. Even excited, she was 30. Veronica has only ridden Ella a couple of times so far. It’s dark by the time she’s done work during the week, so she can only ride on the weekends. But she’s coming several evenings during the week as well to brush her and work on her ground manners. And there has been some improvement already. Today, Veronica worked on getting Ella to lead quietly without dragging the human hither and yon, and to stand nicely for mounting. The footing in the round pen was frozen mud. So they could only walk, but Ella was very well behaved once Veronica was mounted. They walked circles, practiced halts and turns, and just had a nice relaxed session. This is Virginia’s first time on the filly’s back (and only the filly’s second time under saddle). They look like a team already don’t they? The vet was here and had a look at King. She thinks he will be fine. There is still quite a bit of swelling, but it has gone down to about half of what it was yesterday (probably from all the bute, which is an anti inflammatory). His gums and teeth appear to be okay, though she did say that if one of the roots is cracked it might not be apparent right away. He’s on antibiotics as she thinks some of the swelling could be a bit of infection. However she thinks that it’s primarily just trauma… badly bruised from the kick. She is a dentist, and had a good look at Dressy’s teeth and also at Ares while she was here. Dressy has the usual sharp edges on top, and some hooks coming back. She gets those every year, so that’s what I expected. Ares has quite a bit of stuff going on in his mouth, and definitely needs work. Nothing drastic, but just a lot of edges, hooks, etc. He loses a lot of food when he’s chewing, so I knew there was going to be work to do there. She’s offered a very considerable discount on Ares work, which is wonderful. I consider him one of my little charity cases, and I do expect to lose money on him. But it would be nice if he didn’t turn into a money pit. She knows though that I do this for a lot of Standardbreds, to try to get them on track to being useful, happy backyard and/or competition horses instead of ending up as meat or throwaways driven into the ground as buggy horses. So this is my vet’s contribution to my Standardbred rehab efforts. And it’s very much appreciated. I’ve been very careful with Ares, because when I picked him up from his trainer, he came with a warning to be careful. I was a bit confused about exactly what I was to be careful about, but I got the impression that the trainer had some sort of vision of turning him into a riding horse and had tried to back him in a stall. Nothing wrong with that. If you are actually a rider. Which I doubt a Standardbred trainer actually is. Anyway, it seems that he got on Ares and was alarmed at the feeling, so got right back off again. As a result, I’ve been dutifully putting Ares through a more rigorous round of ground training than I normally do with the Standardbreds that I retrain. He’s learned to lunge in tack, with side reins. Made sure that his voice commands are solid (they usually are in driving horses anyway). And have tried to make sure that he is really confident with me and whatever I ask of him. The whole allergic reaction to the yellowjackets episode really worked in my favour as it happens. Ares has been extremely friendly since that happened. I think he perceived my intervention as a rescue (which it was). And since then he’s always happy to see me and pleased with any attention. I’ve gotten to quite like him. He’s very willing and cooperative. Pays attention to me and has energy. Today I put the tack on him and took him into a big box stall. Brought in a small plastic step stool. First I tied him to the wall and just got up and down on the stool beside him. That was no big deal as I have done some of that before while grooming him on the cross ties. I flapped my arms over his back and leaned over him, patting him all over the opposite side. Then rewarded him with a cookie and a great deal of praise. He likes cookies but I think he likes praise even more. He visibly relaxes when he knows he’s doing well. After a bit of that, I unclipped him from the wall. Put weight in the stirrup with my hands. Put my foot in the stirrup. Jumped around. All the usual stuff. Put my foot in the stirrup. Lay across his back. And finally just got up. Throughout the entire process, Ares never moved. The only thing he did was shift his weight once to square up and balance himself under the weight when I finally committed all my weight to his back. After getting on and off him a few times without any flinches or difficulties, I finally picked up the reins and asked him to move a step. First put a tiny bit of leg on him, then clucked. His first step was a bit of a lurch. But then he figured it out and did a calm circle right around the stall. That was all I was trying to accomplish for today, so I stopped and got off. Much praise, patting, and even a kiss on the nose (he’s getting to really like sappy stuff like that). He looked very pleased with himself and his world.